Clearwater, FL., November 9, 2014 – With one look, it’s easy to see the talent Georgia Cherokees’ manager Frank Peters has at his disposal. Still, even he knows there’s no substitute for an ace starter. With “Teddy Baseball,” the Cherokees have that, too. Ted Pratt, who earned a Fall Classic championship game victory in 2012 before getting a no-decision following eight strong innings during last year’s title game win, was at it again, holding the Coral Gables A’s to just four hits in another solid effort and a 9-2 win. Unlike previous starts, this time he didn’t need to dominate. With the game tied 1-1, the Cherokees surrounded run-scoring singles from Nelson Gaston, Ben Blumenthal, Drew Beatty and Drew Suber around a trio of Coral Gables defensive miscues to blow the game open. From there, it was just a matter of Pratt limiting Coral Gables’ comeback opportunities. The A’s plated single runs in the fourth and sixth innings, but left runners in scoring position in the third, fifth and seventh when Pratt made key pitches. The Cherokees, paced by Paul Bacot’s and Vince Palmer’s team leading eight tournament hits and team MVP Ricky Lockwood, Jr., finished round-robin play 3-1. 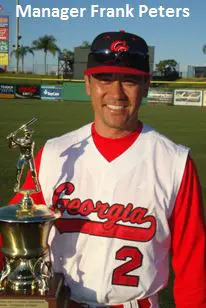 They then topped the Georgia Barons and Brightside Yankees in the playoffs, with John Vidic’s complete-game gem the difference. Coral Gables completed round-robin play at 2-2, including a loss to Georgia in which it rallied back to tie following a 5-0 deficit. The A’s then defeated the Miami Marlins and shut out the Tampa Bay Rays 12-0, behind Alex Arteaga’s complete-game effort, to reach the finals.